STAG ARMS, one of the world’s largest AR-15 manufacturers, is now adding specialized laser engravings on rifles and lowers with the American or Gadsden Flag on the magazine well. 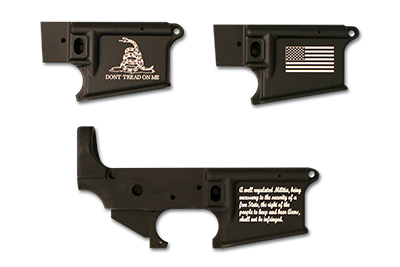 These two new engravings are in addition to the extremely popular second amendment engraving. Unlike an imprint or coating, laser engravings penetrate through the anodized layer to the metal underneath, which makes it impossible to wear off.